When Stranger Things hit Netflix last summer, it came out of nowhere. No one was expecting it to become a pop-culture sensation. That will not be the case with the second season, though—which is out on Friday, and has a huge amount of awareness and hype that changes things considerably. Case in point, you won’t believe what’s going on with Eggo Waffles. Eggo Waffles, of course, are a defining touchstone for Eleven, played by Millie Bobby Brown. She loves them so much that she steals them, and they ultimately became a clue that she’ll be back for season two. So with that finally happening, Eggo is not letting the opportunity go by. 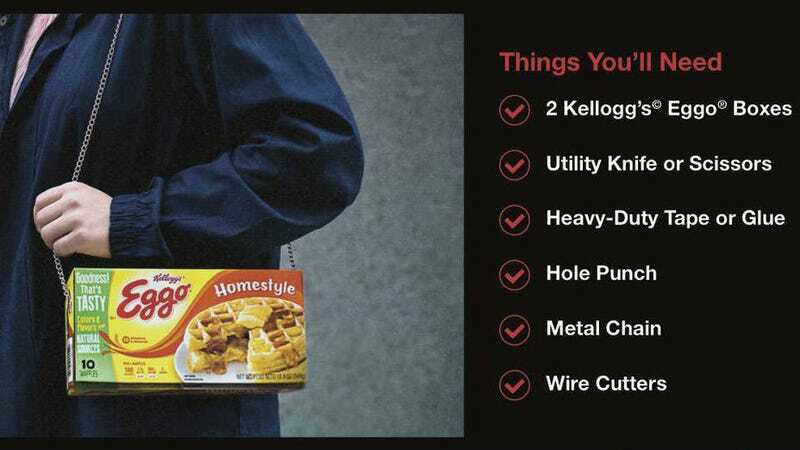 Kellogg’s has a massive marketing campaign in place for Stranger Things 2—including some tips on how to make an Eggo box into a purse. Look at this. And, wouldn’t you know it? You only need to buy two Eggo boxes to make that happen! Everyone is a winner! You have an Eggo purse, and Eggo just sold two boxes of waffles! So what if your parents are mad that you just ate or threw out 20 waffles? But that’s not all. You can also make an Eggo boombox! Or, you know, you could just eat some Eggos. There’s more, too—including episode-by -pisode, themed waffled recipes. Of course, Eggo is by far the only company getting in on the Stranger Things machine. Lyft has some connections. Spotify. The list goes on and on. And if you collect all of those marketing plans and partnerships and put them in a pile, know where you could put them? In your special Eggo purse. Just don’t put anything wet in there. Eggo boxes aren’t particularly sturdy. Read more about it all in the below link.